One of the brightest and most recognizable accessory brands around is Vera Bradley. Its bold patterns and functional designs make it a desirable brand for purses, wallets, and more. But beyond the bright colors is a successful brand that had stood the test of time and showcases the importance of building a brand that lasts. Colorful Way Of Living: How To Be More, Create More, Do More the Vera Bradley Way in which she talks about her road to success. If you talk to Baekgaard, you can see her personality reflected in the Vera Bradley patterns — bold, whimsical, joyful. This is a founder with a colorful personality and story. From realizing that airport stores didn’t sell stylish luggage for women, to creating a public company with 152 locations, Baekgaard has had success on her own terms. In her book, she describes herself as “fussy,” details how she chose her career over her first marriage and talks about why young people should be picky about their employer. No matter the industry, there is a ton of competition for customers’ attention and sales. It can be easy for companies to focus on staying ahead of the competition instead of building their own brand. However, if companies get too caught up in seeing what other organizations are doing, they run the risk of losing focus on their own brand and not building a strong customer experience. Although Vera Bradley operates in the competitive accessory space, it has managed to find its niche and focus on what it is good at — creating an experience and showcasing a special item. 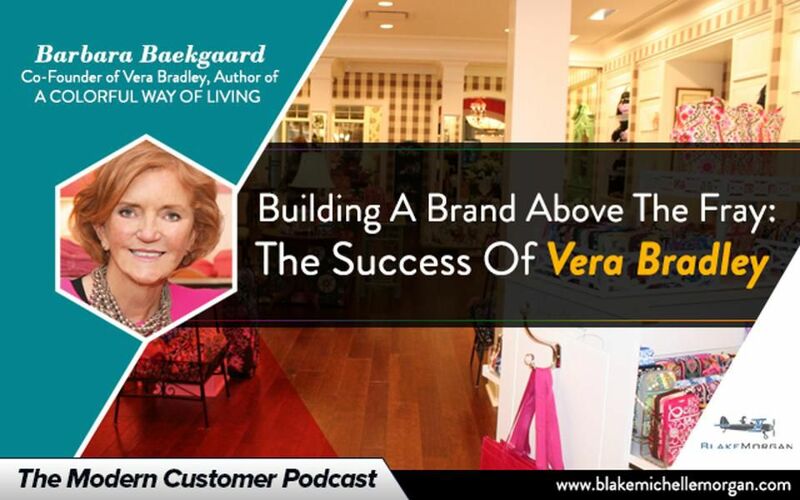 Vera Bradley isn’t a discount brand and typically represents a special product customers are willing to spend more money on. Because of that, cofounder Baekgaard and her team can focus on creating a great customer experience because they are confident in their brand position and aren’t distracted by comparing themselves to other stores. The lesson here can be applied to any brand: find what you are good at and use that to build a personalized and strong experience for customers. Don’t just play catchup to the competition — create something that represents your brand and what you stand for, and customers will respond to that. A strong brand tends to create a great customer experience, and much of that brand starts with corporate culture. With niche brands, customers want something they can count on — the experience is more than a one-time transaction, but a shopping experience that they expect to be enjoyable and lasting. Vera Bradley hires nice people as sales associates and tells them to be themselves. The result is a reputation for strong customer service because customers know they will always have a friendly and personable experience in the store. The same principle applies to customers who are shopping for more than just handbags — today’s modern shoppers tend to want an experience instead of simply a transaction. The best experiences tend to come from strong brands that have an identity that permeates through their employees and makes every step of the buying process enjoyable. Employees should be aware of the company’s brand and know the role they play in sharing the experience with everyone who comes into the store or visits the website. A strong brand can be a powerful tool in creating a high-quality customer experience. Although there are many things that can shake a brand, having a strong foundation that is embedded in every aspect of the organization can make a huge difference and be felt by customers at every turn.